Vine resistant to diseases and pests became a topic for study in the middle of the 19th century, when devastating diseases – powdery mildew, downy mildew, black rot and phylloxera – were introduced into Europe from North America. American vines (V. rupestris, V. lincecumi, V. berlandierietc.) and European vines Vitis vinifera – sensitive varieties for the most part – were crossed to breed new varieties called direct producer hybrids that were resistant to powdery mildew, downy mildew and phylloxera all at once. 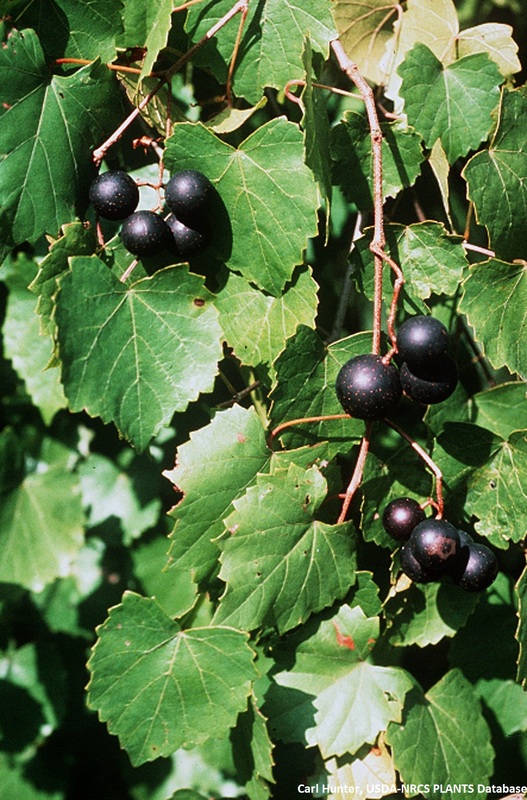 Research developed during the 20th century characterised other sources of resistance: American Vitis (V. rotundifolia, etc.) and also Vitis species of Asian origin (V. amurensis, etc.). These hybrids were so successful that in 1958 30% of French vineyards were covered by fungus resistant grape varieties, i.e. 400,000 ha! However, the insufficient quality of the wine obtained from these hybrids led to their exclusion, in the same way as the first laws on protecting designations of origin in France put the brakes on the development in the 1930s. In 1951, planting hybrid grape varieties in AOC areas was finally banned and only subsisted for table wines. Whilst hybridisation declined in France from the 1950s onwards, it was maintained in other countries like Germany, Switzerland, Hungary and the Czech Republic. 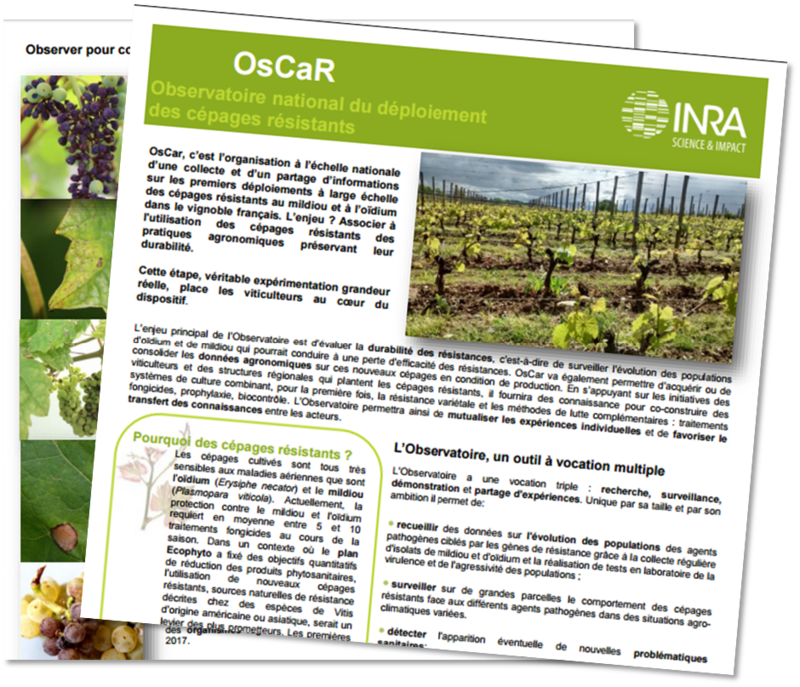 In France today, improving the vine for resistance to downy mildew and powdery mildew is managed by INRA, in partnership with IFV since 2012. The researcher Alain Bouquet started work in 1974 on incorporating resistance factors carried by the species Vitis rotundifolia into the European vine (Vitis vinifera). This programme culminated after 25 years in monogenic varieties christened “Bouquet”, bearing a mildew resistance gene (Rpv1) and a powdery mildew resistance gene (Run1). In 2000, INRA at Colmar commenced a varietal breeding program from “Bouquet” varieties with the goal of integrating several resistance genes into the fungus resistant grape varieties (this is called gene pyramiding) for greater resistance durability. 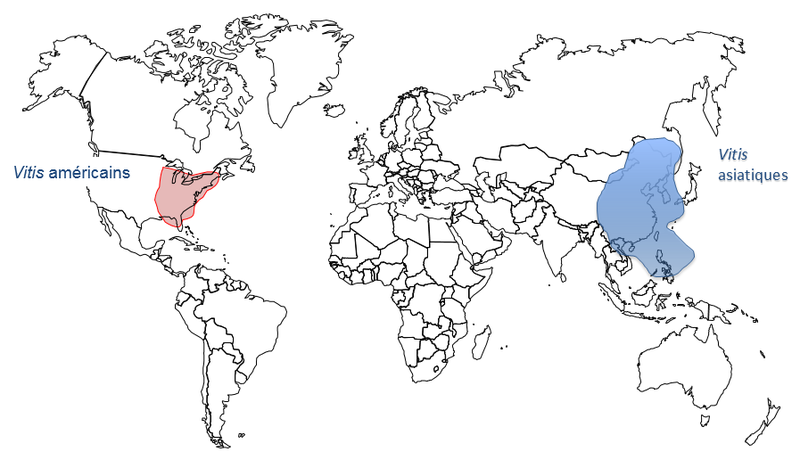 These polygenic varieties are called “ResDur”. Three series of crosses were performed, giving rise to the varieties ResDur 1, 2 and 3, as shown in the diagram below. 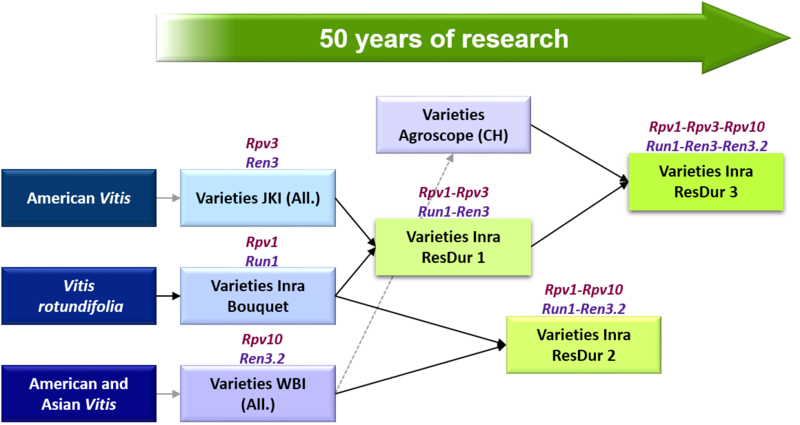 lastly six years of final breeding, during which the agronomic, technological and environmental value of candidate varieties undergo field trials (VATE tests). Today, the ResDur programme is culminating in submission of the varieties Artaban, Vidoc, Floreal and Voltis. The WBI Freiburg is mainly behind the Cabernet Cortis, Monarch, Muscaris or Souvignier gris grape varieties, bred from the 1980s onwards. Find a potential genealogical tree for these grape varieties here. 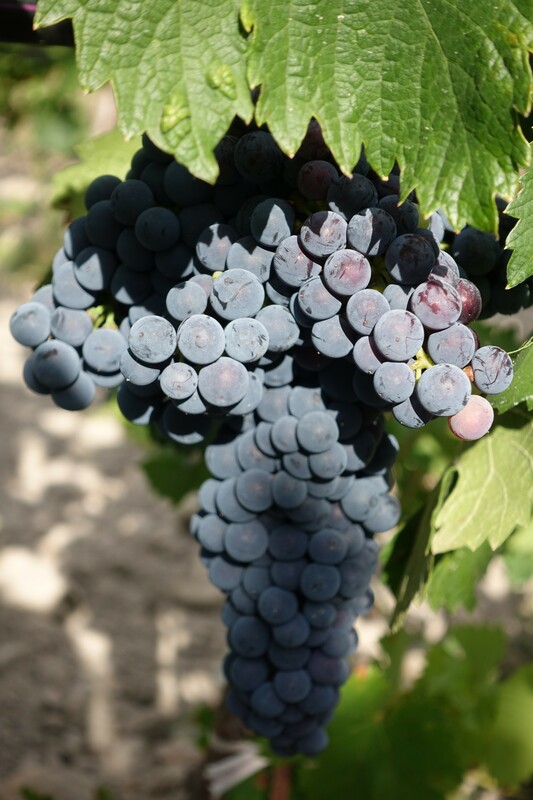 There are more than 113 resistant grape varieties, with 300 ha currently planted with them in Europe.